Miquon Day Camp officially begins the day with a gathering at the Playbarn. After a morning song or game, and announcement, campers are dismissed to start their day of activities. Schedules have been developed for each bunk providing a balance between structured activities and choice time. Because we believe strongly in the importance of self-directed play, we are sure to provide time each day for campers to choose where and how they would like to play. 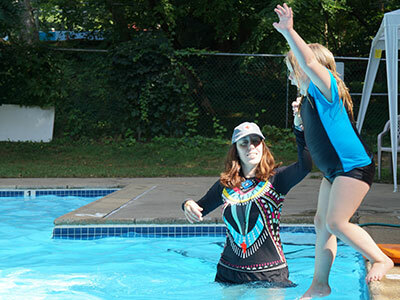 Campers often chose to play on one of our playgrounds, explore the creek or join a club for the day. During the week, campers have special activities which include, Arts and Crafts, Athletics, Drama, Music, and Nature. Twice each day bunks will visit the Pool; in the morning for instructional swim and a free swim in the afternoon. Check out a sample schedule!